Karnataka rich with scenic beauty, is located at the southern part of India. Resourceful with all kind of varieties including temples, wild life sanctuaries, water falls, cosmopolitan cities, valleys, hill resorts, beaches etc..., Karnataka is a must visit state in India for all tourist enthusiasts and will not get disappointed. The weather is very moderate at southern districts. The temperature remains ideal throughout the year. Most part of the Karnataka state are agricultural lands as the state is rich in rivers. The western part has Arabian see and then the range of Western Ghats follows. This is the eighth largest state in India both in area and population. This state is famous for its natural beauty, rich culture and pleasant climate. Bangalore is the capital city of Karnataka and is famous as IT hub housing many small and large IT companies. Kannada is the official (spoken and public correspondence) language of the state. But, the accent varies from region to region within the state. We will discuss some important places of various districts to travel as destinations in Karnataka. Here are details of various districts on Karnataka tourism. Visit the individual district page for more details about important places to visit and the distances of each place from various other places. During Ancient times Karnataka was well known for the trade with Arab and European countries. This place was known as Kuntala Desha. Mauryan empire got established with Kanakagiri as the capital during Fourth Century B.C. The region was established upto Vindhyas at North and Deccan at South by Satakarnis. The areas was then ruled by Kadambas, Gangas and Chalukyas. Rashtrakuta Dynasty ruled this region during Eighth to Tenth Century. Later, Yadavas of Devagiri, Kalachuris of Kalyani and Hoysalas of Dwarasamudra were well known. Devaraya and Krishnadevaraya were the two powerful kings of Vijayanagara Empire founded by Vidyaranya through Hakka and Bukka and lasted till Sixteenth Century. Later the area was ruled by Nayakas, Paleyagars and Wodeyars. During Eighteenth century Haider Ali took over and his son Tipu Sultan ruled till his death. The area was then called Mysore. 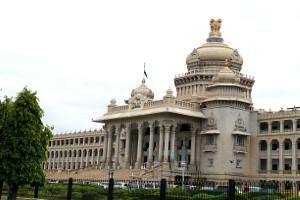 Bangalore (renamed as Bengaluru from 1st November 2014) is the capital city of Karnataka state. Bangalore is also called the garden city of India. Many reputed scientific institutions are situated here. The city is also known as the Silicon Valley of India as the growth of Informatin and Technology is very rapid. The surroundings of the city is beautiful and it has got a very pleasant climate. Belgaum was the capital of Rattas once upon a time. Situated at north west side, this district shares the border of Karnataka with Mumbai (Maharashtra) and Goa. The place is well known for Muslim, Hindu and Jain culture having temples (Anantha Shayana, Maruti, Kapileshwara), shrines (Durga and Ganapati), mosques (Safa and Jama masjid) and Jain Basadis (Kamala Basadi, considered as a monument). Belgaum is well known for the Fort which is situated at the heart of the city. This place is considered as the Kishkindha, the place which is mentioned in the great epic Ramayana, which was the kingdom of Vaanara sena. Bellary, situated at a distance of 300Kms from Bangalore, shares the border at East with Andhra Pradesh. The place is located between two mountains. On one of the hills there is a fort. Once upon a time, Bidar was the capital of Bahmani Kingdom. This district is the north most part of Karnataka state and was a part of Chalukyan Empire. The city is well known for Fort of Bidar which has got five gates (paanch Darwazas) and other monuments . Bijapur is at the North side of Karnataka and shares the border with Maharashtra. Bijapur was the capital during Muslim Dynasty and known as City of Victory. The city has historic architecture (Islamic) and was also the capital of Adil Shahi Dynasty. Chamrajnagar was one of the Taluk headquarters under Mysore district before it became an independent district head quarters. Now, the Chamrajnagar is well known for its hill stations (MM Hills and BR Hills) and the temples situated in these hill area. Chamrajnagar is 60Kms from Mysore towards South. Chikmagalur is located 240Kms from Bangalore towards North-West direction (from Bangalore). The place is located in a fertile valley south of the Baba-Budan hill range. The town is surrounded by lush coffee growing hills. Malnad, the name what Kannada people use for the range of hills, rich in green valleys, come under many places of this district. Chitradurga shares the border at East with Andhra Pradesh and stretches to the center part of karnataka almost. It was once the capital of Paleyagars with great history. There is a hill nearer to the city surrounded by seven fortifications and seven temples dedicated to Gopalaswamy, Sampige Siddeswara and goddess Ucchangamma. The place takes us to the ages of Ramayana. Jatayu, the bird, fell at this place after getting wounded during fighting with Ravana to save Sita Devi. The place also has importance considering Maha Bharatha. Bhima, one of the Pandavas, killed the Rakshas Hidimbasura here. There is Hidimbeshwara temple which is one of the oldest. Onake Obavva, the lady who killed many muslim soldiers to safe gaurd the fort, has remained in the memories of local people with her heroism and patriotism. Known as Scotland of India, this district shares the border with Kerala state. Rich in green fields, famous for coffee plantation, Orange orchards and couple of well known Water falls. 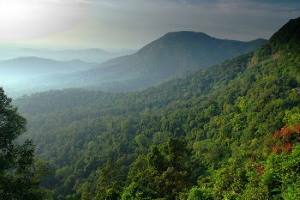 Coorg district is also called Madikeri and Kodagu. The city is situated in West direction from Bangalore, the capital city of Karnataka state, at a distance of 260Kms. This is the next district head quarters in this lane after Mysore. Dakshina kannada shares the coastal area at West (Arabian sea) with few other districts of Karnataka. Palm beaches, dense green forests, azure waters and vallies are the highlights of this place. Famous, well known Yakshagana is originated from this area. Mangalore is the main city and is connected to Bengaluru via Hassan through NH48. Dharwad is located at a distance of 425Kms from the capital city Bangalore in Karnataka. The city is well known for education and business. University of Karnataka and University of Ugricultural sciences are located here. Dattatreya temple, Durga Devi temple, Panduranga temple, Basel Mission church and All Saints Church are some of the important tourist places. Gulbarga, which is at a distance of 625Kms from Bangalore, shares the border with Andhra Pradesh towards East and is situated below Bidar. This place was well known during Bahamani Dynasty founded by Hasan Gangu. Before breaking upto become Deccan Peninsula, this was an oldest place of Gondwana Plateau. Hassan is well known for ISRO Master Control Facility (MCF) situated just 6Kms from the town. This is a ground control station for Insat series and other satellites. Hassan district is famous for temples built during Hoysala period. This district is located at the border of Western ghats (also called Malnad area locally). This district is in between Bangalore and Mangalore on National Highway 48 and well connected even by rail. The distance between Bangalore and Hassan is nearly 200Kms. The history of this district is with mainly Hoysalas and Gangas. It has got destinations for Shaivas(shivalaya temples at various places in the district like Halebid), Vaishnavas(temples at places like Belagali, Javagal, Konanur, Belur etc...) and jains (monuments at various places including Jinanathapura beside Shravanabelagola). The monuments are of Hoysala style. There are two Hoysala temples dedicated to Lord Virupakshehswara and Lord Channakeshava. Rivers Hemavathi, Yagachi and Cauvery river tributes flow in the district and the southern part is well irrigated. Mandya district is in between Bangalore and Mysore and on the way from Bangalore towards west. Rich in ugricultural lands as many number of major rivers in southern Karnataka pass through the district. 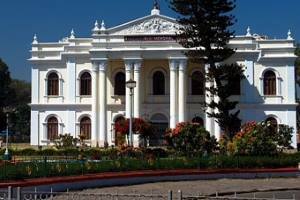 Mysore is called the city of palaces because of the existance of many number of palaces. Mysore located 770m above sea level is 140Kms (South-West) from Bangalore. Mysore is an old city one must visit to know about Indian history, art and culture. Like many other districts in the East, Raichur (situated at a distance of 400Kms approximately from Bangalore) also shares its border with Andhra Pradesh. It has got a hill fort representing Hindu military architecture. Raichur is one of the destination for Kannadigas to visit Mantralaya situated very nearer in the Kurnool district of Andhra Pradesh. Shimoga district lies in western ghats, locally called Malnad. The distance between Bangalore and Shimoga is 280Kms and situated at North-West direction from Bangalore. This district has beautiful forests with waterfalls. Shimoga town is situated at the banks of river Tunga. Udupi is also one of the west coast district of Karnataka state. 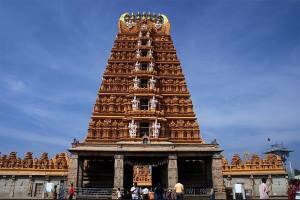 The famous Chandramouleshwara temple is situated here. The name Udupi came from the name Udupa meaning Moon. 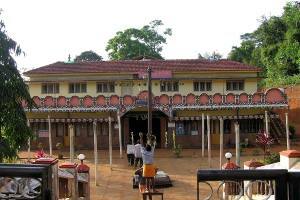 The district headquarters Udupi is known as pilgrim centre. The place is also known for its delicious cuisine and the restaurants all over the country. The district headquarters is 420Kms from Bangalore towards West. Nearest airport is Mangalore. Uttara Kannada district of Karnataka is nearer to Goa which shares the boarder at North east direction. The district headquarter is Karwar and has got an excellent beach resort. The distance between Bangalore and Karwar is nearly 530kms towards west. The journey will be through thick western ghats. Uttara Kannada is separated by Udupi from Dakshin Kannada to share the West coast at Arabian Sea of India in Karnataka. The place, well known as Karavali, is world famous for beautiful beaches with islands, light houses and relics. 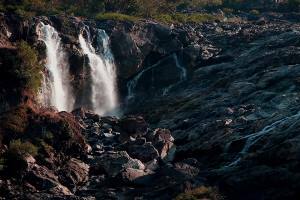 1.Jog water falls in Shimoga district on river Sharavati is the highest water falls in India with the height of 253mtrs. it is good for the beginner. Karanataka is the one of the very most popular state in our india & mysore palace is one of the best in the world. 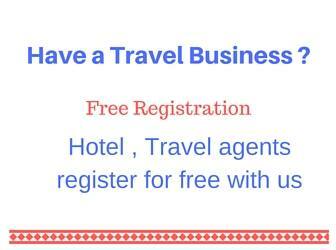 Please send me tour packages in Karnataka, we are 6 Adults. Bengaluru is very beautiful place of indian country. No second thought, karnataka is known as 'One place, many world' and it is. We are planning to go for cauvery fishing could you help me out for other tourist places can be visited in & around cauvery fishing.